A few months ago, we let you know that Ruthie Davis (a footwear fave of celebrities like Beyonce, Lady Gaga, Taraji. P Henson and many others) was releasing a "two-for" line (see here). Now that it's too cold to don flip-flops for your commute to and from work, her Sushi Combos REALLY come in handy. Besides, you're too put-together for flip-flops or non-matching flats anyway. The clouds and/ or rain (depending on where you're located) today may have you feeling a little blue. Navy patent platform peep toed mary janes (and their flat partners) are just what you need. Try the Davis by Ruthie Davis Edamame/ Sashimi Combo (available at Endless.com). The red and purple accents add the pop you need to pump up your mood. Plus, the rubber strap provides a futuristic twist (wouldn't be a Davis pump without some futuristic pop). What goes better with sushi than sake? This drink might look like a run of the mill martini or cosmo, but it's actually a Leblon and Sake Caipirinha. Made with Leblon Cachaca (Brazilian rum), Ty-Ku Sake, raspberries and lime juice, it's a semi-tart concoction with a kick. (And it brings out the red in your heels. Wink, wink.) 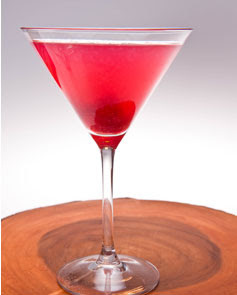 It's so tasty that you may want to have a few, but remember, a lady sips and doesn't guzzle. If you can consume slowly, you can avoid the fast track to embarrassing situations.